There is a 1-time registration fee of $25 for NEW STUDENTS who have not previously attended camps/study at the center. 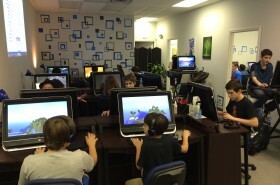 Most students sign up for the extended day where they may continue to work on the daily activity or enjoy added team play with friends, Minecraft, Roblox, computer games, crafts, board-games, optional STEM activities, movies, and more! Mindcraft, Roblox, and other fun video games. Every player has their own computer/seat at our LARGE touch screen computers! No comments by spiderts yet.